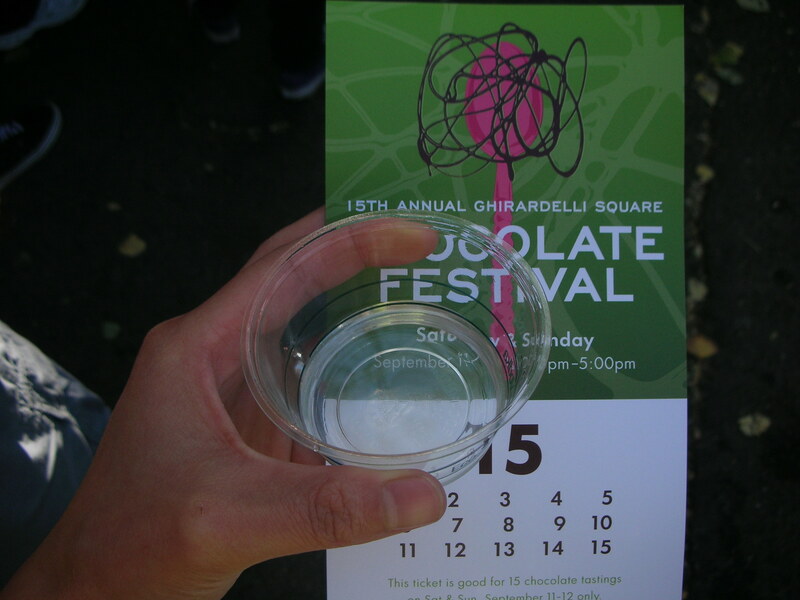 Courtesy of LivingSocial, I got two tickets to last weekend’s Ghirardelli Square Chocolate Festival for $10. Regular ticket prices were $20 a pop. Although it’s been going on for 15 years, I never went as I doubted whether it was worth the price. With the LivingSocial discount, there was no excuse not to go. The proceeds of the festival went to Project Open Hand, which provides meals and nutrition counseling to persons affected by AIDS and HIV. As you’ve read earlier, my father has been in the ICU for the past week with an (as yet) undiagnosed condition. Thankfully he was moved out of ICU to a regular recovery room yesterday. On top of my father’s condition, Hubby and I had to tour some apartments as we’re finally moving out of my parent’s home. So it’s been a bit stressful and busy over here. I was meaning to go to the Chocolate Festival with a friend Saturday but had to visit my father and look at some apartments instead. The festival took place on Sunday as well though so I was able to check it out for about an hour after work. When I got there I was immediately struck by the LINES. I didn’t expect there to be so many people at the festival. With your ticket, you receive da card with numbers 1 – 15 on it. Every time you got a sample from a business, they would mark off a number. So $20 (normal ticket price) = 15 samples. As we only had an hour, Hubby and I immediately set to get as many samples as we could, scanning the crowds to see which lines were the shortest. We would just get into a line and ask the people in front of us what we were waiting in line for. LOL. The first line we got into ended up being for Vodka from McCormick Distilling. Right after we got in, they announced that they had run out of their 360 Double Chocolate Vodka so they were just providing samples of their Vanilla instead, which we definitely didn’t have a problem with. 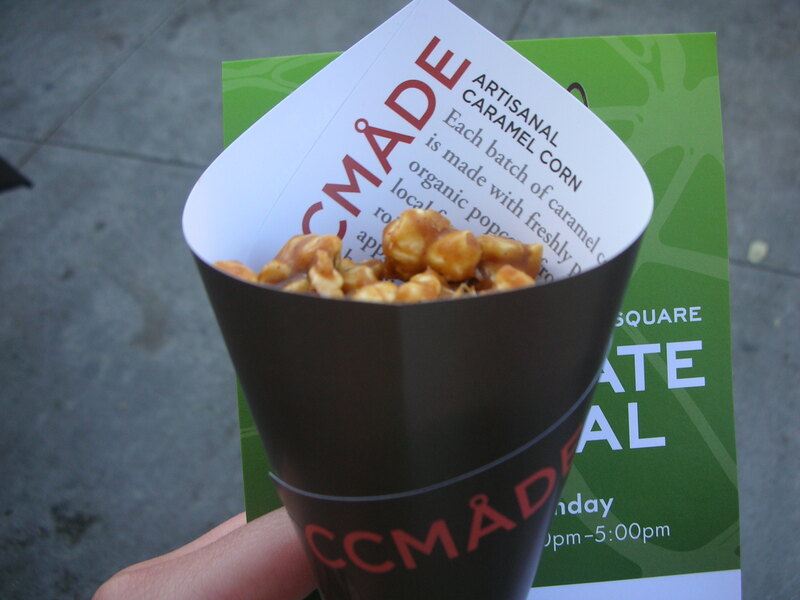 We only got a few samples because the lines were so freaking long and by 4:45pm, the businesses were already closing up shop. 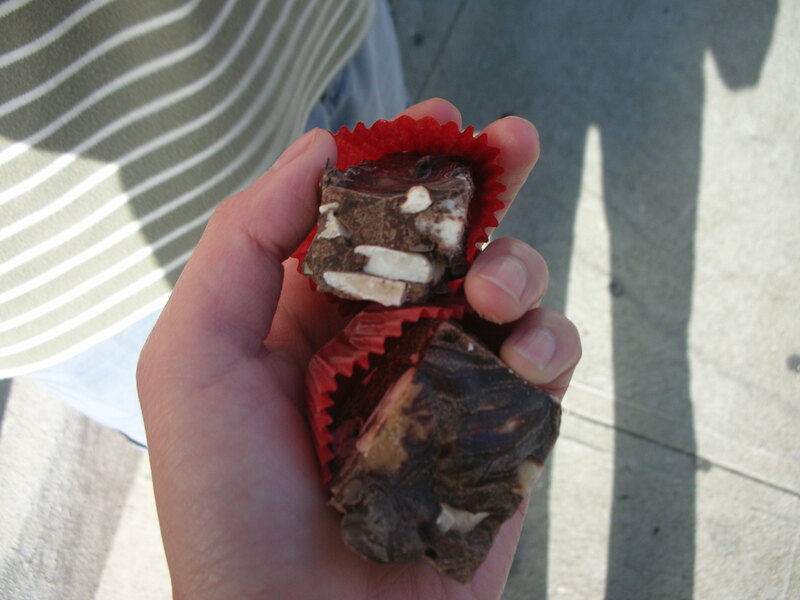 I did like the Caramel Corn from CC MADE and these chunks of dark chocolate with nuts and marshmallows (from which vendor I can’t for the life of me remember). 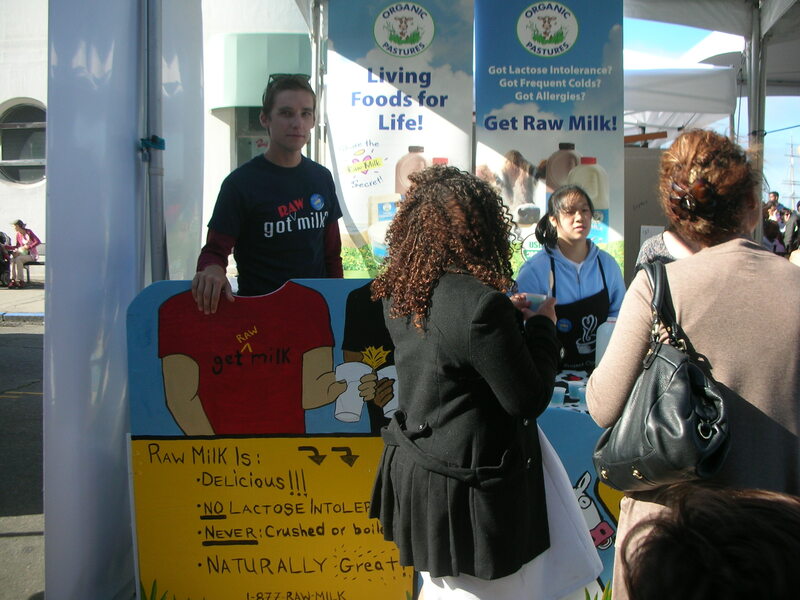 Organic Pastures was there giving samples of their raw milk for free (no number marking) so Hubby went to get samples twice, declaring that milk is really good with chocolate. I told him milk is also really good with brownies and muffins. Apparently they don’t run to the fridge for midnight snacks in Holland. Gee, I guess that’s another reason why Americans are fatter. Hubby is on a mission to consume as much protein as he can so after the cutie at the stand told him the grams of protein in a cup, he limped off for a third sample. 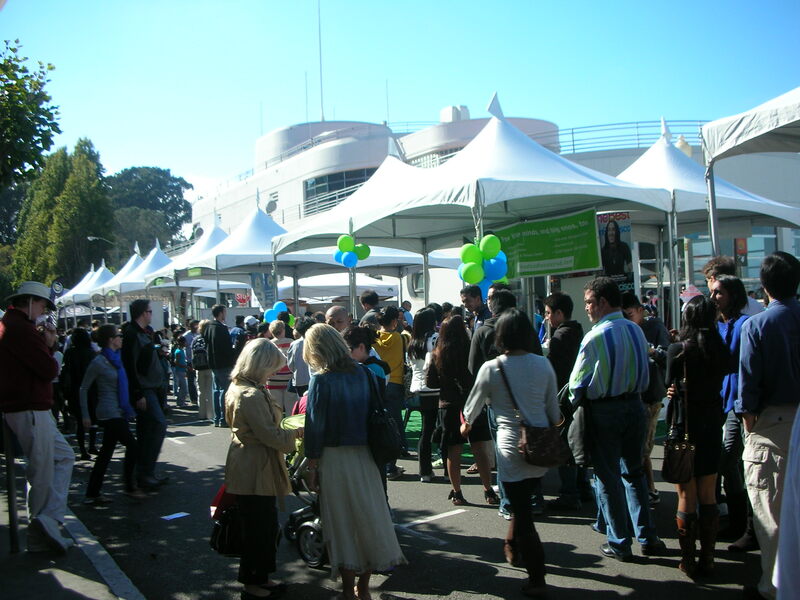 I hope that they’re able to get more vendors next year as there clearly wasn’t enough for the crowds. Ghirardelli Square used to be quite touristy and kind of dead but now it’s much livelier thanks to an influx businesses. 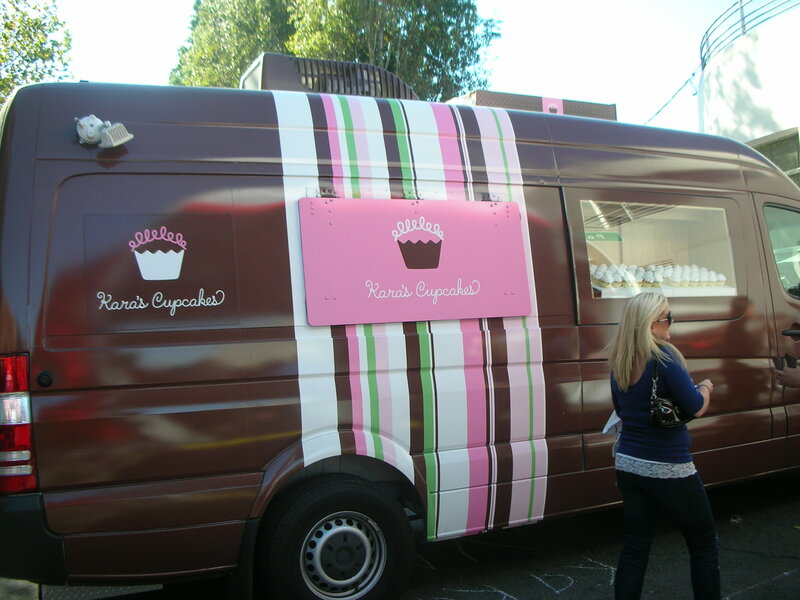 Kara’s Cupcakes and Cellar360 are some of my favorites. Ana Mandara is a fusion Vietnamese restaurant that is spectacularly designed and decorated in the French-Indo colonial style. The food, however, isn’t really up to par and overpriced. Instead, go upstairs to get a drink and listen to some piano music in their lounge, which overlooks the restaurant. I have yet to visit Crown & Crumpet but I swear it will be done one day! I challenge any woman to walk past and not want to go in. It’s like every stereotypical aspect of girlishness packed into one room. 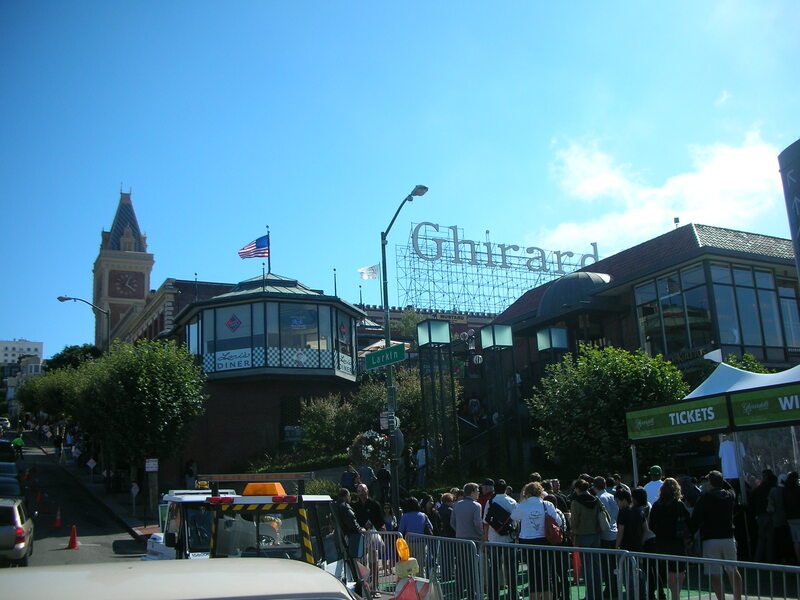 Ghirardelli Chocolate Festival – one of the very many reasons why I love San Francisco. 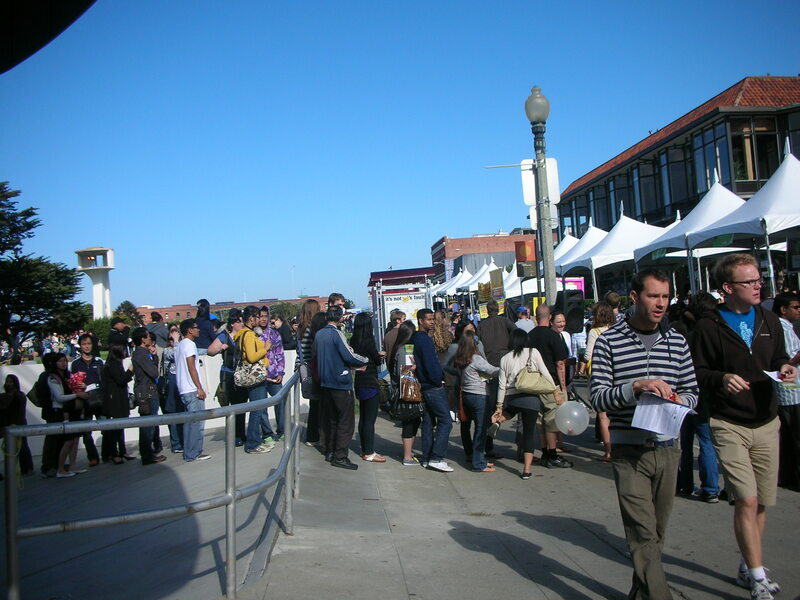 Okay, you had me at Ghiradelli and festival. I love all things chocolate related… and I agree that there’s nothing better than raw milk with a hunk of brownie (or two). If you ever make it to Seattle, there’s an awesome chocolate tour you can go on with everything from chocolate and port parings to wonderful salted chocolate caramels. 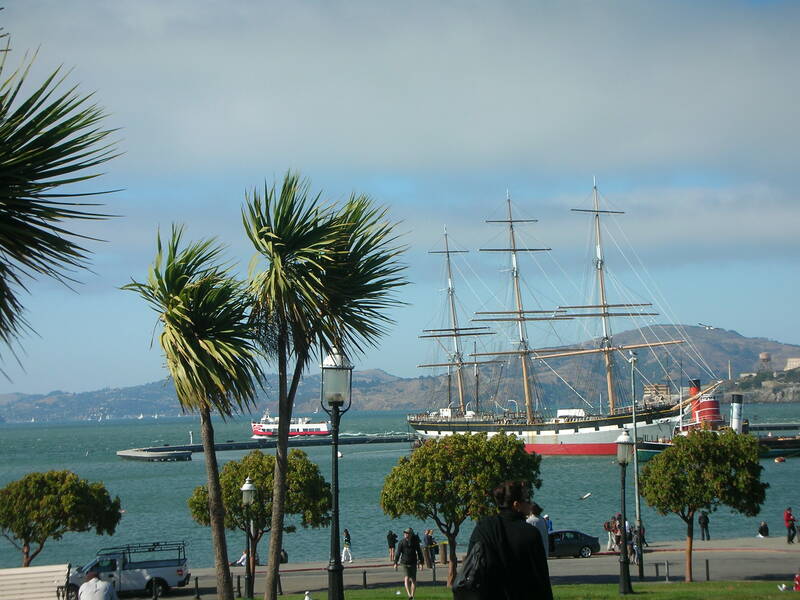 btw, I love SF, so I’ll be looking forward to reading more of your adventures there. I used to live in SD, so I made it up there often. I’ve been to Seattle once but just for a day so I didn’t get to do and see much. The tour sounds awesome so I’ll keep it in mind if I end up going up that way again. Thanks!